Sky to air 3D footage from Second World War | What Hi-Fi? Sky is to broadcast never before seen 3D footage of the Second World War. The documentary has been put together by Sky 3D and History by Flight 33 using stereoscopic film found in the archives of the Imperial War Museum. The footage comes from a documentary shot by the Nazis in 1943 called 'Die Flakschiesslehre' or 'Anti-Aircraft Firing Instructions'. It's the only known 3D footage of the German army in action, and also included an instruction video on how to project in 3D. The programme will also combine up-to-date 3D technology to show some of the historic sites of the Second World War. 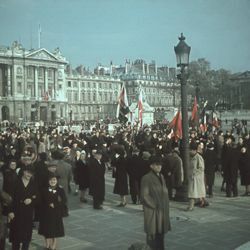 3D photographs taken by the Nazis and Allied photos will also feature in the 'WW II in 3D' programme. John Cassy, director of 3D, said: "This is truly a remarkable find – seeing the 3D footage made by the Nazis and the accompanying films on how to use them is a compelling insight into how the medium was used during the war. 3D is often seen as a modern innovation, but this incredible footage reminds us that it’s been around for decades." WW II in 3D will air on Sky 3D on 26th May at 10pm.